WunderGrip is the market leader in vinyl non-slip padding. Vinyl affords maximum gripping power and cushioning without the thickness of other pads. WunderGrip will not stain or discolor your floor, and is washable. 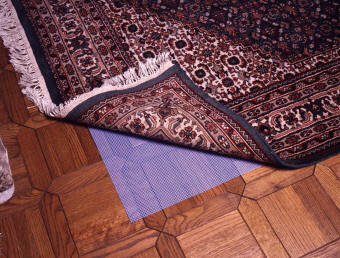 Open pattern construction makes vacuuming easier by allowing greater airflow, and lessens the chance of harmful mildew. Guaranteed for 20 years to maintain all non-slip properties. Roll widths available are 2', 32", 3', 4', 6', 8', 9', 10', and 12', all are 98' in length. Precut sizes available 27"x48", 3'x5', 4'x6', 5'x8', 6'x9', 8'x10', 8'3"x11'6", 9'x12', 10'x14', and 12'x16'. BlueGrip is the high-tech underlay for superior gripping power. Completely non-directional, it grips firmly in any direction and has a clean, contemporary look that gives efficient performance. Open construction evaporates moisture and makes vacuuming more efficient. Guaranteed for 10 years to maintain all non-slip properties. Roll widths available are 2', 32", 6', 8', 9', 10', and 12', all rolls are 98' in length. Precut sizes available 27"x48", 3'x5', 4'x6', 6'x9', 8'x10', 8'3"x11'6", 9'x12', and 10'x14'. Structure is made of 100% polyester fabric coasted with pure vinyl. Designed with closed construction, Structure provides maximum floor contact. 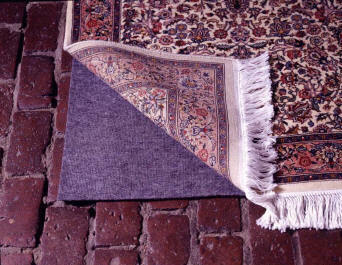 Excellent for use under lightweight and thin area rugs. Guaranteed for 10 years to maintain all non-slip properties. 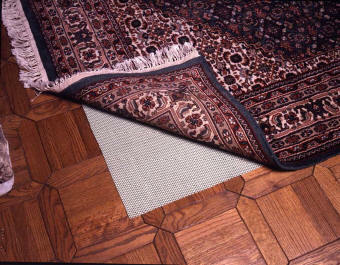 WunderFirm provided extra padding for thin lightweight rugs. This underlay gives the feel of more body to the area rug and allows it to lay flat on top of grout lines, mortar joints, and warped hardwood floors. 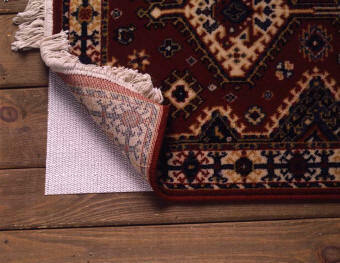 Constructed with a needle-punch top and nonskid backing, WunderFirm will not damage the floor or area rug. It is 1/4" thick and reversible for rugs on top of carpeting. Roll widths available are 6' and 12', all rolls are 65' in length.